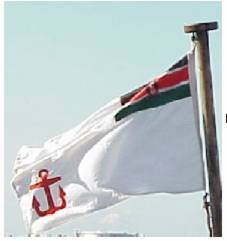 Kenya's naval ensign is charged with a simple red anchor. I am not sure of the correct shade of the anchor - it is most likely the dark-red colour of the national flag. Source: flag table in Jane's Fighting Ships. In the Croatian edition of [smi80]) this flag is designated as civil ensign (i.e. ---/C--), but that is obviously an error. I wonder what is in other issues? White ensign (without red cross) with the national flag in canton and red anchor in fly. The different sources give this flag differently. It seems that there is no doubt that what are the differences, the flag in canton is always covering the full 1/4 of the flag field. The Album gives the ratio as 5:9~, and the same has [smi80]. However, the Shipmate flagchart has it in ratio 1:2, while Graham Bartram's World Flag Database clearly designates it as 2:3. The other difference is the anchor. Album again matches well with [smi82] putting it in lower fly (though with minor differences in artistic rendition). The Shipmate flagchart has quite similar anchor but in the middle of the fly, while Graham has rather differently shown anchor showing details and 3D features, also in the middle of the fly. An other mystery ? 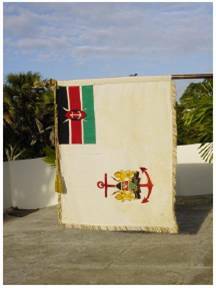 Here is a photo of the Kenya naval ensign, as shown on the Kenya Ministry of Defence website (http://www.mod.go.ke). It is interesting to note that the canton on this actual flag is actually quite small, being something like 1/3 the length and width of the ensign, unlike on the other version we illustrate. Also the anchor is of a different shape than that illustrated above, and is placed right down at the lower fly corner. 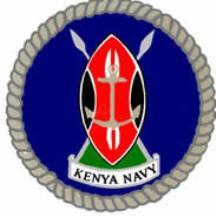 Here is an image of the Presidential Colour of the Kenya Navy. I have also included a photo (see below) as a reference. Unlike the British equivalent (from which this Colour is based on) the Kenyan version has golden fringe (Source: Kenya Ministry of Defence website at http://www.mod.go.ke). Here is an image of the flag of the Commander (of the navy). The two stars are for a rear admiral. (Source: Kenya Ministry of Defence website: http://www.mod.go.ke).